SEAN GALLAGHER HAS revealed that he has made a voluntary disclosure to the Standards in Public Office Commission “in the interests of transparency”. The announcement comes weeks after scrutiny of presidential spending by the Public Accounts Committee found an annual unaudited allowance of €317,000. Speaking at the launch of his presidential campaign today, the businessman said that he had made the disclosure because he felt that trust was one of his core values and a cornerstone of democracy. “In this regard, I have endavoured to lead by example by making a voluntary disclosure to SIPO,” he said. Gallagher urged the government to carry out an annual audit of all expenditure associated with the office, which he said belonged to the people of Ireland. He also praised his rival Michael D Higgins as an “inspiring politician”, saying the people of Ireland were tired of negative politics. “He has given his life [and] he has given a lifetime to public service, and I think he has done a good job,” Gallagher said. If elected, Gallagher committed to introduce 20 ‘special initiatives’ in his first 20 weeks in office, details of which will be announced next week. Asked whether he could overturn a commanding lead by Higgins in the race for the presidency, Gallagher joked that he was “living proof that unprecedented things happen”, a reference to his controversial election loss in 2011. Email “'I want to succeed Michael D, not replace him': Sean Gallagher formally launches presidential campaign”. 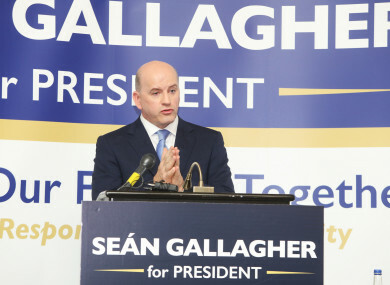 Feedback on “'I want to succeed Michael D, not replace him': Sean Gallagher formally launches presidential campaign”.